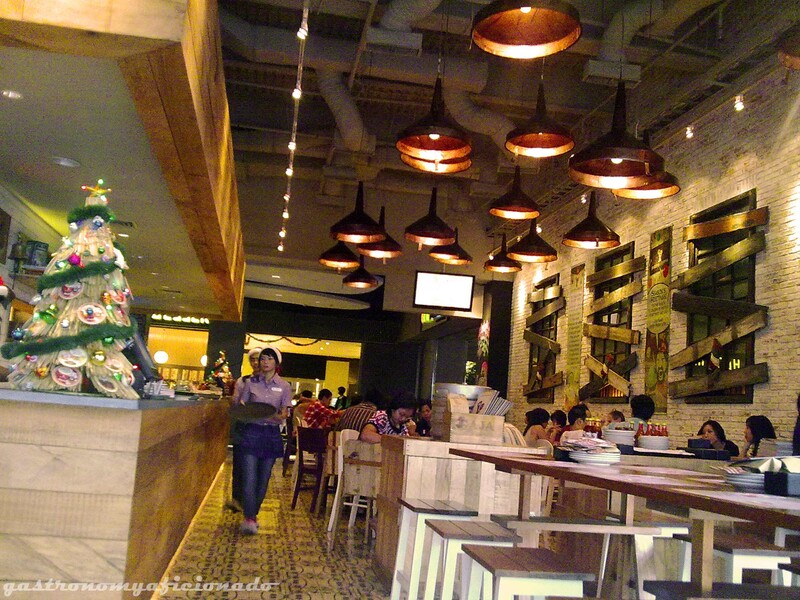 Running out of ideas for lunch in Central Jakarta, we went (again) to Plaza Indonesia for more options. We were thinking about Pepper Lunch again or perhaps trying the all new Food Kulture, but then she gave the idea for either Japanese or Italian lunch. So we set aside Food Kulture for now and as we had browsed the menu and gotten interested in it, we picked Pizza e Birra. The place turned out to be one of the famous joints owned by Ismaya Group, a very prominent group that owns Social House, Puro, Blowfish, Dragonfly, Pasta de Waraku, Sushi Groove, etc. The design of the place was like a secret dining place in an abandoned building because you can see the walls decorated with windows shut by planks and indeed you can see planks at almost everywhere. The bar itself was dominated with planks. But as you walk further in, the atmosphere getting much calmer because it gets secluded somehow from passerbys in front of the joint and they got sofas too with the exceptional view to Thamrin Street. The waiters/waitresses were also well-behaved and helpful. I figure that Ismaya Group always held their high standards above all. You can judge it easily from the looks of their website. Very neat and colorful. Plus if you’re coming to the venues (I had visited Social House, Pasta de Waraku, and Sushi Groove earlier) and you’ll see the similarities they have. It’s what I called the whole package. Starting from the plates, the tissues, the uniforms, and everything was planned and designed as one. It feels like they’re creating the whole new trademark with this. No doubt they really do serious business and will one day expand overseas. Okay, that’s from the packaging. How about the most important issue from all? The food itself! So that time was the lunchtime, we’re very fond of Italian, and since it’s named Pizza e Birra, then everything’s matched well. 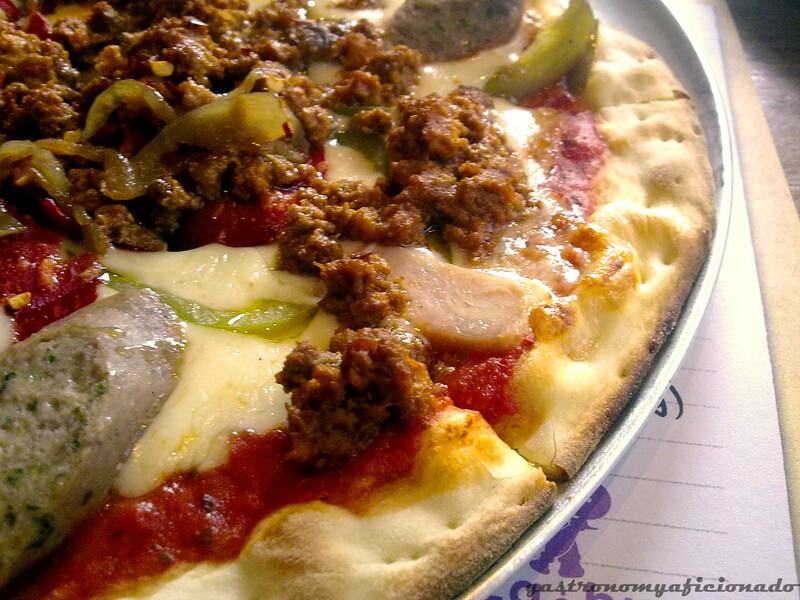 We picked one from the special menu for that time and it was the Pizza Meat Heaven Large Size (IDR 69,000). I was thinking to also add a pasta dish but since it’s gonna be too heavy for both of us, adding an appetizer instead seem to be nice that time. I saw the chili con carne dishes for the appetizer and I instantly wanted it at once since I really had been wanting to taste it since I played The Sims 2. Haha.. chili con carne was another Mexican or Tex-Mex cuisine. You can simply call it a beef stew but in a more Mexican way with those chilis and beans. Should be delicious! 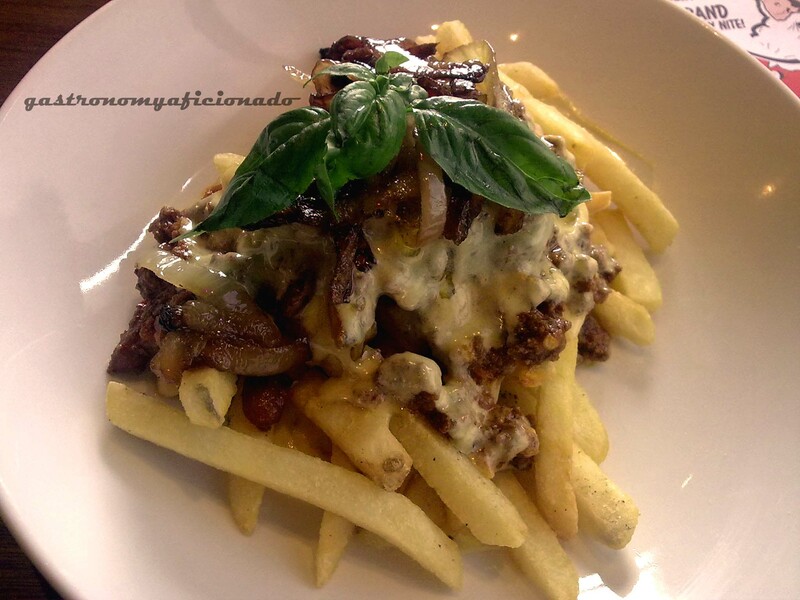 Among the selections, I picked Blue Cheese Royale Chili con Carne (IDR 39,000). For the drinks, no beers of course though they say that Pizza and Beer were a match made in heaven. 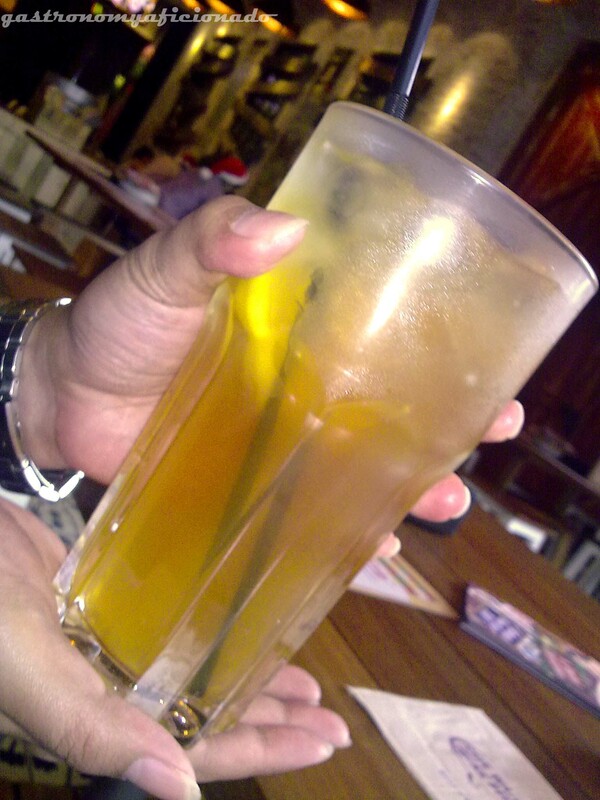 We chose instead the coffee and the big size iced lemon tea. 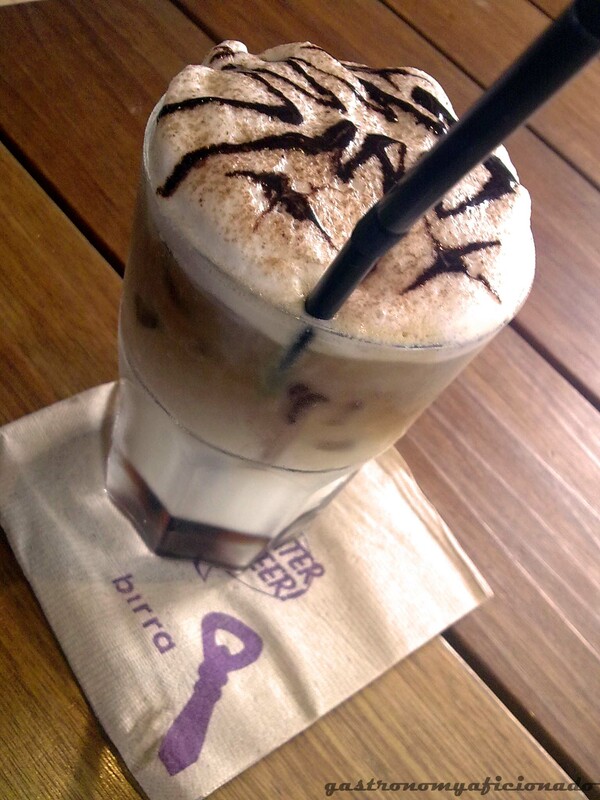 Those were Southern Ice Lemon Tea (IDR 18,000) and Iced Irish Cream Cappuccino (IDR 33,000). The chili con carne arrived first. They added the french fries in it though originally they add tortilla with it. One might say that it’s a chili, chips, and cheese but using the melted blue cheese on it and you know what, it a truly heavenly magnificently tasty dish. Forgive the obsessive hyperbolic grammar, but it was indeed delicious! It’s even good enough as a proper main dish. You just can’t stop digging it. It was rich, thick, sinful, and of course, succulent! You gotta try this one though I honestly believe the blue cheese really help a lot with the taste. So I’d recommend you to pick the one I had. As for the pizza, it was surprisingly average. Well, anybody would’ve been very familiar with pizza and the toppings I had was beef in many forms like the ones they named Meat Lovers in Pizza Hut. Even so, we always put the olive oil and parmesan in any Italian dishes we had no matter how bland or tasty they were. Aside from pizza, they also provide pasta, calzone, panini, and dessert pizza. That would be a good alternative for me next time actually since the pizza wasn’t that special. Overall, to conclude this fairly friendly post from me, Pizza e Birra was a decent place to be visited. The price was quite friendly and the taste was quite decent. Clearly, the chili con carne saved the day and the coffee yet the lemon tea were also good but since they put the name PIZZA e BIRRA, supposedly the pizza should be good right? They need to improve in this or else in my next visit, rage will rule the day. Not really my style though comfy enough. It was good and they’re knowledgeable about the menu which was very helpful. Too bad the pizza was so-so but the chili con carne was amazing! You should instead change into Chili con Carne e Birra if you can’t improve the taste. I really appreciate about your concerns regarding the flaws Pizza e Birra has here and that’s actually quite a vital one. I was thinking that I might have praised the waiters/waitresses too much. Hehe.. But anyway, let’s make a conclusion instead. We, as the customer, need to be proactive. That time, I asked specifically that the coffee should arrive later and they really did comply to that. So in your case regarding the sweet pizza, I suppose you need to tell them that beforehand. As for the ‘spicy’ pasta, well.. that cannot be helped. But since I’m naturally not too fond of spicy things, I’d ask first about it and ask to reduce it if it’s too spicy (in case I really wanted the dish so much, but that’s rarely happen though). I hope that Pizza e Birra could grow better and fix the flaws from concerns like this. I’d certainly forward this post and comments if they happen to have a Facebook account or something similar so they can read it. Wow, dr. B himself come for the visit. Welcome! I have to agree about the pizza. It’s so-so but you shud really try the chili con carne. I’ll give it a try for the dessert pizza next time I visit Pizza e Birra. The service was not that good? Hmmm.. I think I might have to revisit and evaluate again. If that’s true, that’s gonna a less score for Pizze e Birra. Too bad. Hoho.. Anyway, enjoy your visit here, dr B!